After the president’s budget was released on Monday, House Budget Committee Chairman John Yarmuth (D-KY) called it “A Budget for a Declining America.” Unfortunately, that might be an understatement. The Trump administration’s Fiscal Year 2020 budget proposal is a compilation of the worst ideas to come out of the Republican Party over the last decade. It would dismantle public investments that lay the foundation for economic growth, resulting in less innovation. It would shred the social safety net, resulting in more poverty. It would rip away access to affordable health care, resulting in more disease. It would cut taxes for the rich, resulting in more income inequality. It would bloat the defense budget, resulting in more wasteful spending. And all this would add up to a higher national debt than the policies in President Obama’s final budget proposal. The most harmful aspect of Trump’s fiscal blueprint is its scheme for gutting investments in public goods that are core responsibilities of government. 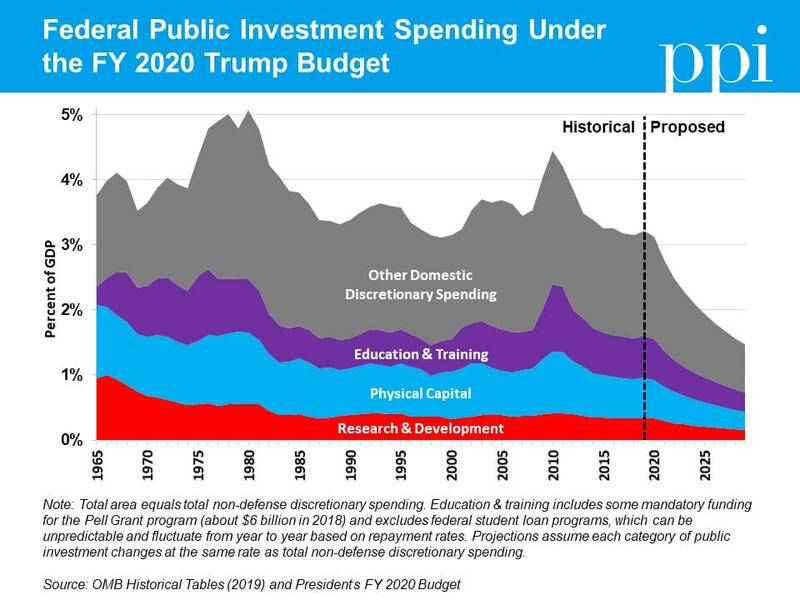 The administration proposes to reduce the share of gross domestic product devoted to non-defense (domestic) discretionary spending – the category of the budget that is annually appropriated by Congress and includes most federal spending on infrastructure, education, and scientific research – by more than half over the next decade. The result is deep cuts to all three of these important investments that provide the foundation for long-term economic growth.